This 4130 tab is welded to the rear upright of a f/c chassis for the rear tree top tubes to mount to. 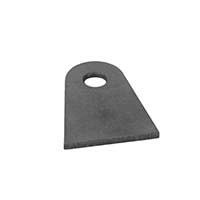 4 pcs per car required.The base width of this tab is 1 1/2" and the thickness is 1/8". The hole size is 3/8" and the height of the center line is 1 1/2".